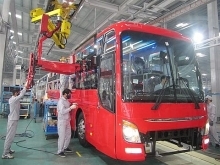 In order to help boost the Vietnamese automobile industry – one of the most important contributors to national economic growth – the country could do with focusing on its policy stability, market expansion, support industry development, and connectivity reinforcement, according to insiders. The dream of a Vietnamese automobile has been nurtured by many Vietnamese enterprises for a long time. After nearly 30 years, Vingroup – one of the largest private companies in Vietnam – made the dream come true by rolling out its two Vinfast cars at the 120th Paris Motor Show in October. 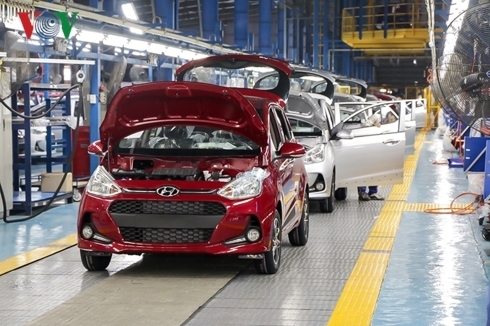 Experts assessed that together with the strength of big names like Truong Hai Auto Corporation (Thaco) and Hyundai Thanh Cong Company, the event was a firm foundation, creating a breakthrough for the development of the domestic automobile industry after years of slow growth. The fact shows that the industry has developed rapidly over the past two years with several major projects being carried out, including a Vinfast automobile manufacturing complex project, which has a total investment of 35 trillion VND (1.49 billion USD) and a capacity of 500,000 units per year; a Thaco Mazda automobile plant project totalling 12 trillion VND with a yearly capacity of 100,000 units; and a 1.32 trillion VND Hyundai Thai Cong automobile factory project which has a capacity of 40,000 units annually. According to the Ministry of Industry and Trade, the output of locally manufactured and assembled automobiles surpassed 200,000 units for the first time in 2015, up 51 percent compared with that of the previous year. In 2016, domestic automobile manufacturing reached 283,300 units. Some kinds of vehicles have been exported to Laos, Cambodia, Myanmar, and the Central American region. However, the localisation rate of the automobile industry remains low due to the lack of a network of material suppliers and large-scale parts producers. According to the ministry’s Department of Industry, although the target rate was set at 40 percent for 2005 and 60 percent for 2010, it sits at just 7 to 10 percent on average. Thaco leads among manufacturers with a rate of 15 to 18 percent, while Toyota Motor Vietnam reaches 37 percent for the Innova model alone. Currently, Vietnam has 358 automobile-related manufacturing enterprises, including 50 assembly businesses, 45 chassis and body manufacturers, and 214 parts producers. The number of auto parts producers is reportedly much lower than in Thailand, which has 2,500 enterprises. The industry just produces a number of simple parts such as components for chassis, trunks, cabinets, doors, tires and tubes, radiators, brake lines, electrical wires, and wheel rims. Luong Duc Toan, an official from the Ministry of Industry and Trade’s Department of Industry, stated that the support industry is one of the most decisive factors for the prices of locally manufactured or assembled cars. However, a weak-performing support industry has made Vietnam’s automobile production costs higher than those of imported ones from other ASEAN countries from 10-20 percent. Toan said the market capacity was limited by auto assemblers and many different models, which makes it difficult for automakers and part producers to invest in developing production. Deputy General Director of Toyota Motor Vietnam (TMV) Shinjiro Kajikawa said that the market scale plays an important role in the development of the auto sector and support industry. However, the Vietnamese automobile market scale is quite small, he said, adding that under 300,000 units of different models are sold each year. The scale is just one-tenth of the Thai market and one-fourth of the Indonesian market. He stressed that the Vietnamese automobile market has not had stable regulations, leaving investors hesitant and keeping domestic production low. To expand the localisation rate, he suggested the Vietnamese Government consider effective policies to reduce investment costs and launch a concerted policy system, especially in taxation policies. Toan underlined the need to improve the capacity of enterprises operating in the support industry so as to meet the requirements of the global production chain. He proposed the formation of a preferential credit package, similar to the one to develop high-tech agriculture, to develop the support industry for the automobile sector, as well as the establishment of industrial support centres to attract foreign investment, especially from the world’s leading spare parts manufacturers.